The point’s awards are a fun way of promoting all the various roles highlands can do. You don’t have to be especially good at any one task; you just need to have a go. They are completely free to enter and you do not have to collect signatures, if you say you have done something we believe you! From time to time we send out a blank multipurpose card but you can also get dedicated cards from the forum or by e mailing Helen.boden2@btinternet.com The points awards runs from January 1st to December 31st the closing date for entries is the 114th January. For the non competitive member there are the Happy Hacker and Happy Hiker cards. Rosettes are awarded for hacking or hiking, i.e. ponies being lead or sometimes joining rides unridden. Members need to log their hours and submit a card to Helen detailing what they have done. You can get merit rosettes for 0-50 hours, a bronze for 50-100, a silver for 100-150 hours a gold for 150 – 200 and platinum for 200+. There is also an overall trophy for the pony that did the maximum number of hacking hours , The Humphrey of Coombebank trophy, and on for the maximum hours of hiking ( Daisy of Glensheil trophy ). 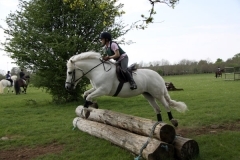 For a member who does compete there are individual ponies’ cards, for dressage, driving, le trec, general riding (including showing), side addle, endurance, jumping, hunting, veteran, for newcomers to the awards, western riding, and in hand showing. It is really helpful to the judge if you could add any relevant information, i.e. the level of competition, the nature of the show. There are also rider based cards for different ages of rider, junior (up to 18), intermediate (18 – 25) and senior (25+) and mature (50+) . There is also an award for amateur breeders to record the success of their stock. In addition we have nomination awards for, working highland of the year, and unsung hero, where members can nominate any person or pony. There is also an award for "Highland Pony Ambassador" this is awarded to a pony who the committee feel as promoted the breed in a particular way. The trophies have been awarded over the years by members and commemorate both individual ponies and studs. We also award really lovely rosettes and like to give out one to anyone who has a go. In addition when all the points are in and added up then we award a trophy for best mare, gelding and stallion and overall champion and reserve champion pony of the year. When you submit your card please fill out cards carefully, making them legible to middle aged stressed woman late at night! Do keep a photocopy for your records and contact me if you are worried that I may not have received your card. Please do not register them as it causes me all kinds of collection problems. We are happy to accept cards by post, e mail or carrier pigeon, do contact Helen if you want to enquire about any of the awards.